Last Saturday, we took five horses and 11 riders to the Horsemanship Challenge. I rode last year [Regular Programming], but declined to do so this year. Horse show tomorrow. Not riding. I will watch & help. Stomach heard "horse show" & reacted accordingly. Trying to talk sense to it. Up early. Bad dreams rather than nerves. I think. @amberwriter At least the yelling stopped when I woke up. They didn’t have enough blue ribbons on the day. [Show Report] The rosette in the earlier post was a stunt double. TBs going past for turnout. Sniff. We continue to show at a saddleseat barn that has a resident hunter/jumper trainer. I have yipped about this before [Echoes]. Tweeting as a groom was an experiment. Turns out I had much to do but little to say. The point of the Horsemanship Challenge was to show on an unknown horse. Each rider pulled a horse out of the proverbial hat, or in this case, plastic food storage bag. Then, we all ran about identifying our horses for other riders and helping our riders track down their mounts. Repeat for two divisions with three classes each. I spent the day getting subsets of child, saddle, horse, & bridle into the same point in time & space. Exciting moments consisted of “Yes, this is Willie.” or “Oh, here is Annie’s bridle.” Useful information, but hardly an exciting tweet. I have not done a full-on grooming day in a long time. My feet hurt so badly afterwards that my in-house masseur had to give me a foot rub before I could stand up long enough to take a shower. 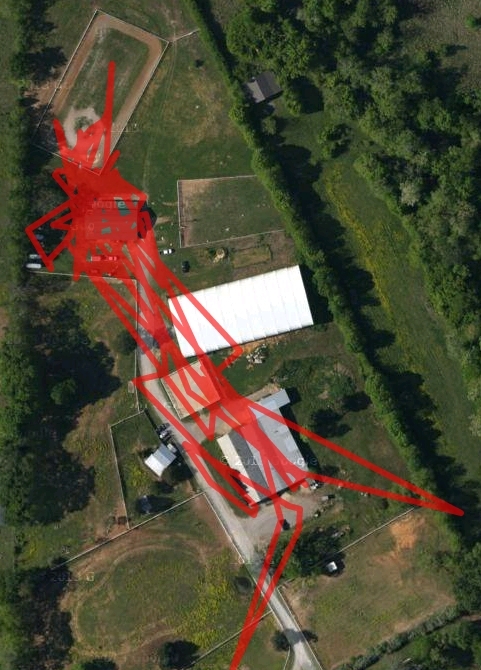 My GPS track for the day. A friend invited me to dinner that night. Technically, an event could have existed that would have drawn me out of the house. Short of resurrected family members, none came to mind.